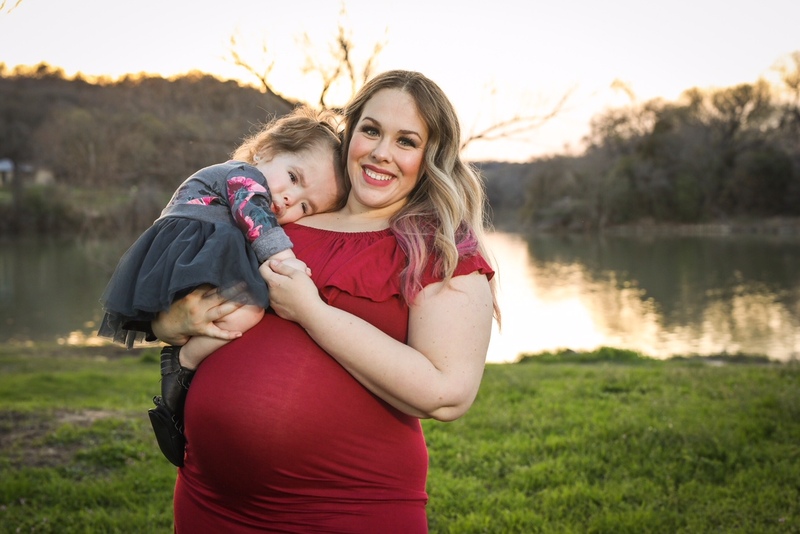 I’m so excited to share photos from our maternity photoshoot! 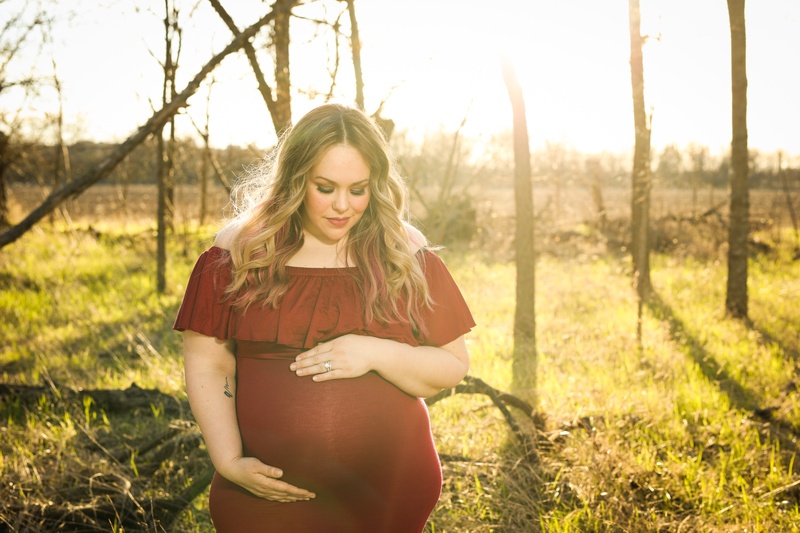 I never had the opportunity to have maternity pictures taken when I was pregnant with Addie due to delivering her the weekend that I was supposed to get my pictures done, so I really wanted to make sure we got them this time. 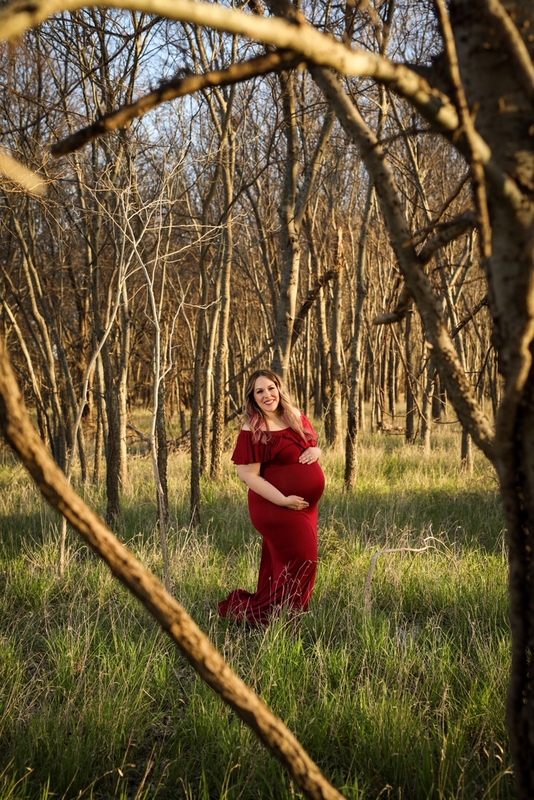 If you’ve never had maternity pictures, I’ll tell you- it’s something you should definitely do. 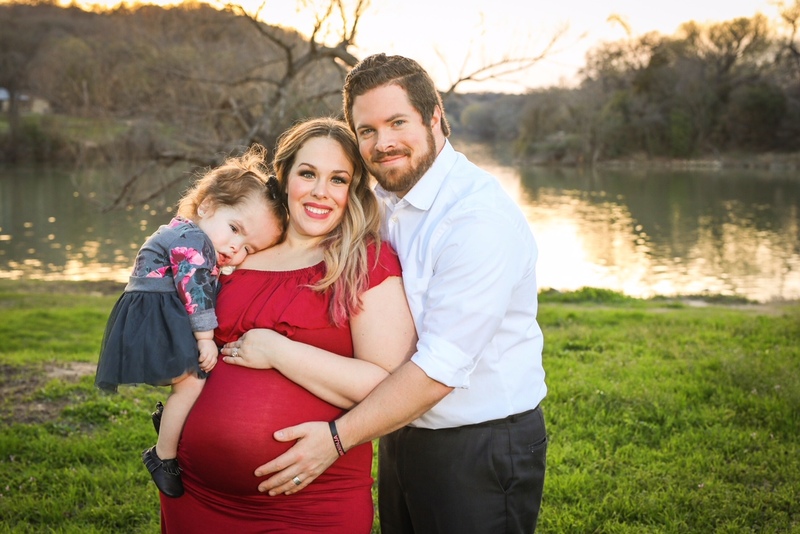 I absolutely regretted not having them done with Addie and this photoshoot was just so wonderful for our family. 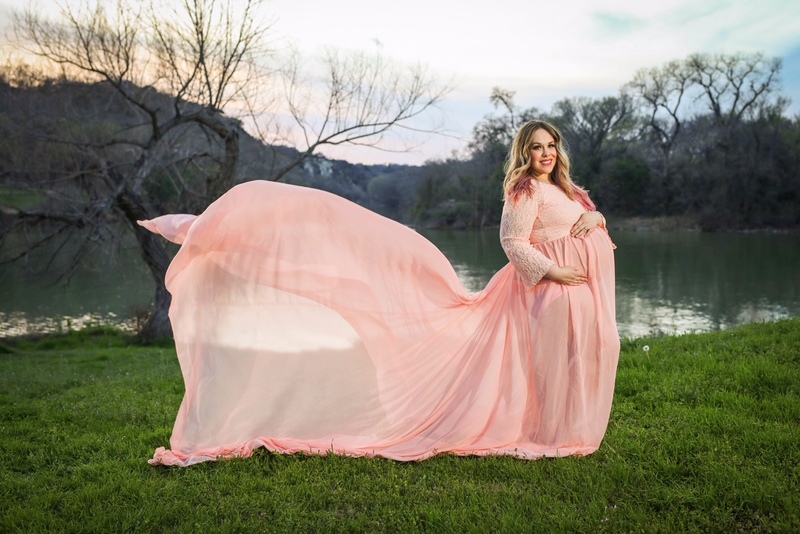 Having a winter maternity photoshoot in Texas isn’t easy. Some days it was super cold, others it was rainy. Some days were nice and we couldn’t coordinate our schedules, and some days were down right yucky. Thanks to our amazing photographer Rhonda Williams and her husband Tim, from Photography by Legacy Imaging, we were able to find the most perfect day anyone could ask for and got some amazing pictures. 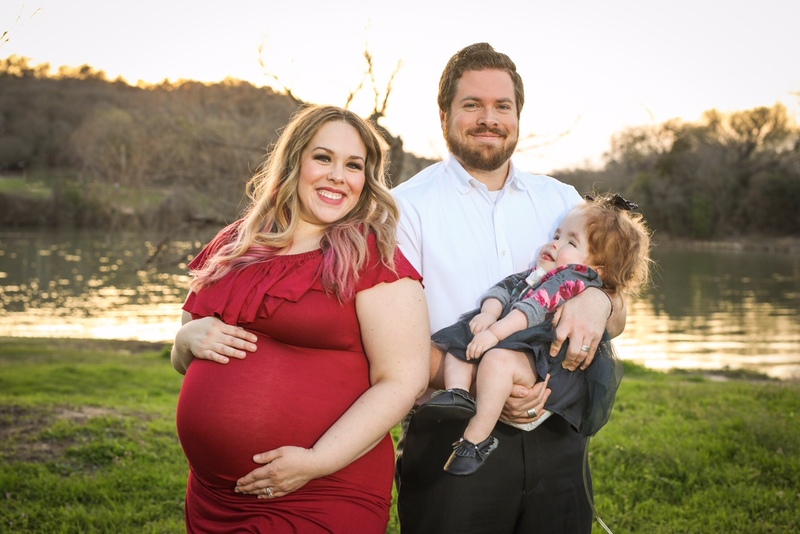 I found this gorgeous red maternity dress off of Amazon and knew I needed it. 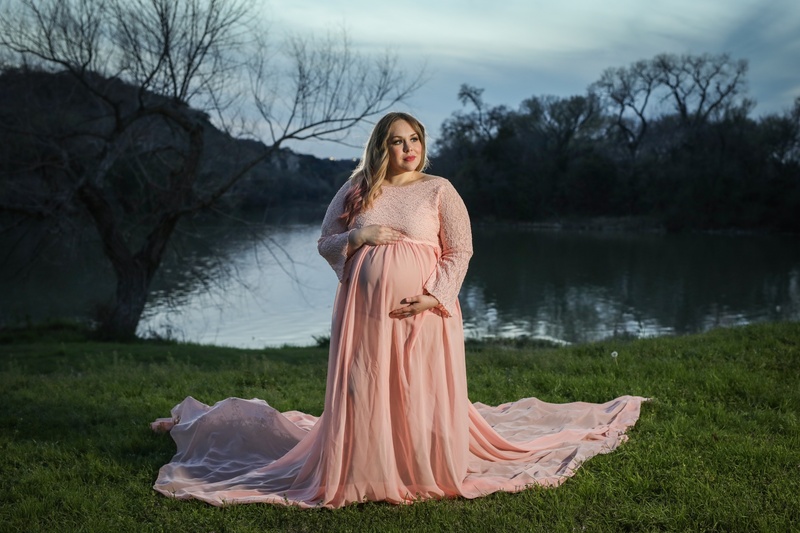 It was perfect for a winter maternity photoshoot in Texas because I could stand it if it was warm or cold outside, it was inexpensive (less than $30! Whoa! ), and we could coordinate outfits together well. I love that it came in a BUNCH of colors too! The pink dress in my photoshoot was actually Rhonda’s and I’m so glad I tried it on. I found a dupe of the pink dress here on Etsy. Not exact, but pretty close! We got some amazing pictures with that dress and I am so insanely pleased at how they came out. If you notice the pictures with Addie, you may have been able to tell that she’s missing a lot of cords! Girlfriend ROCKED this photoshoot with eyes open, smiles, NO CIRCUIT, NO VENTILATOR, and just a little oxygen. I’m so proud of her and how far she’s come. 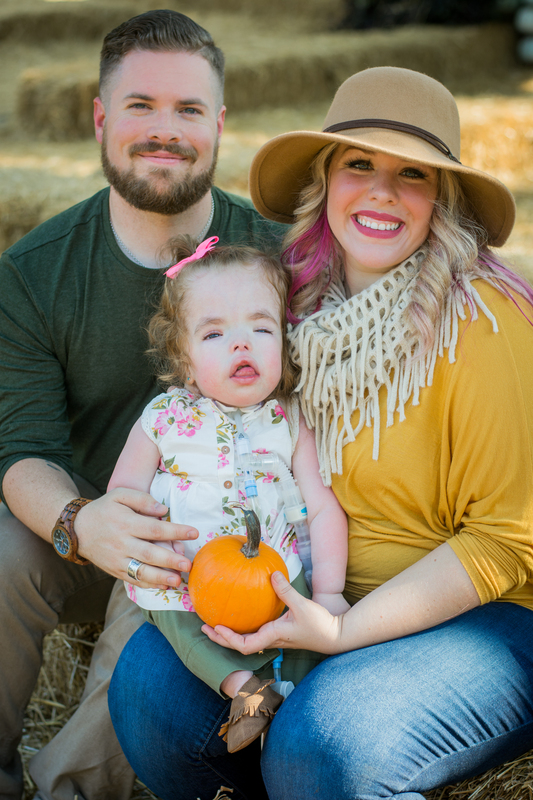 Photoshoots are draining for kids in general, and Addie gets overstimulated so easily. 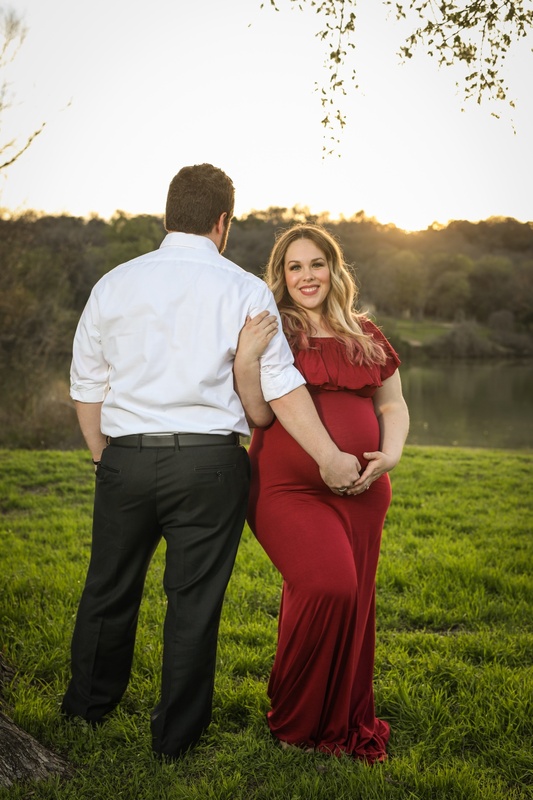 Because the weather was so nice, Rhonda and Tim were extremely patient, and Tim shook a little pom pom for Addie, we got some beautiful maternity photos that I can’t wait to blow up and put in our home. Of course, when you live in Waco and have a photoshoot, you have to stop by the iconic Suspension Bridge. If you’re a fan of the show, Fixer Upper, I’m sure you’ve noticed it in the show intro. I love how the light hits so perfectly for these! The last time we got professional pictures done at the Suspension Bridge were for our engagement photos, so I love that I was able to get some great photos there as an update. The pink dress shots are my absolute FAVORITE. I borrowed the dress from Rhonda’s collection (here’s the closest pink dress I can find to it online). The train on it was massive and it made for some incredible shots. I definitely would like to add some of these to our gallery wall in our living room. We took these pictures in Brazos Park East in Waco and it was the perfect spot to end for the night. 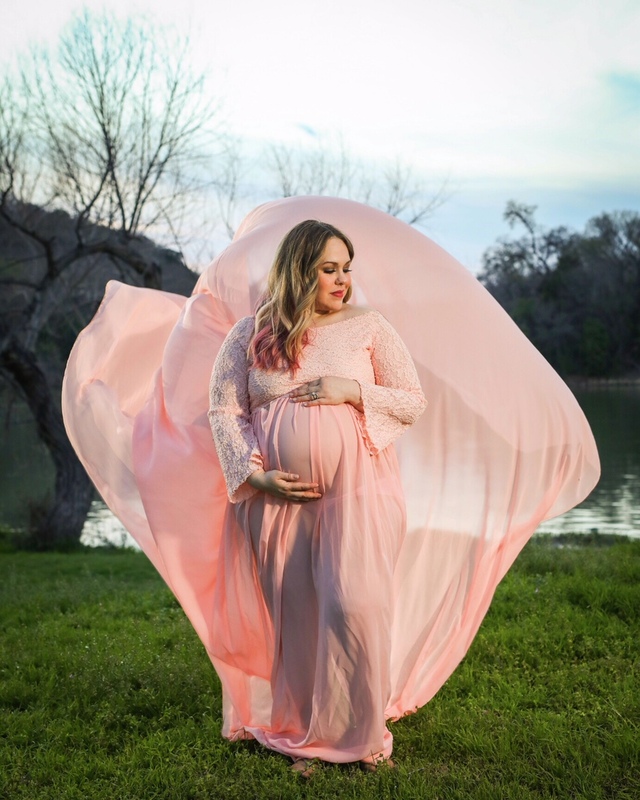 Talk about a perfect dress for a winter maternity photoshoot, right!? Another fun location we stopped at was this random wooded area on the side of the road. Sometimes you find great spots for pictures in the most unlikely places! I would have driven right past this area had it not been for Rhonda and Tim! The trees, the sun- it was all perfect. I wish we could’ve gotten Mathew and Addie in these shots but we literally were climbing over branches, my dress was getting stuck, and it would’ve been crazy with all her equipment. Still, I had so much fun! 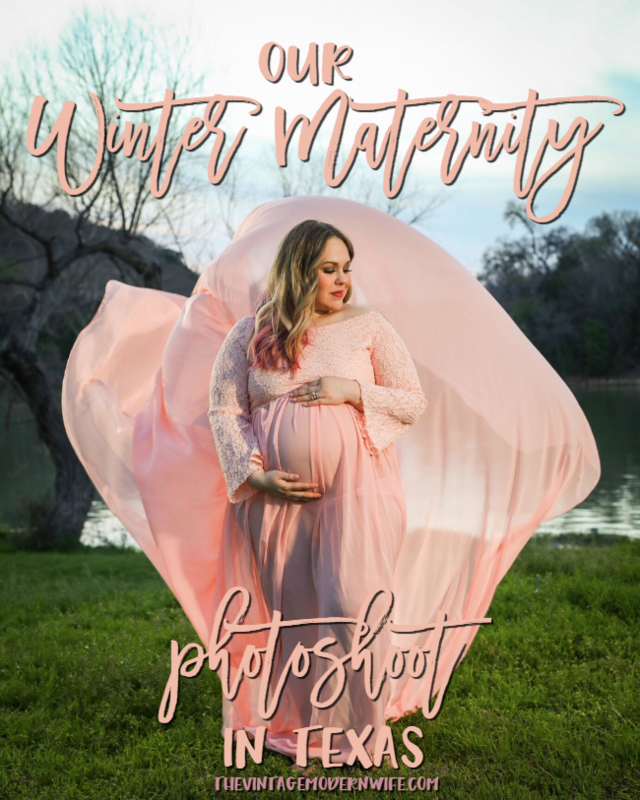 Overall, I couldn’t have asked for a better winter maternity photoshoot. 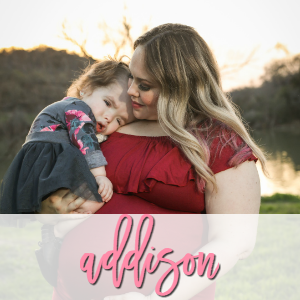 There are so many things we missed due to my rough pregnancy with Addie like maternity pictures, newborn photos, even taking her home after a few days. 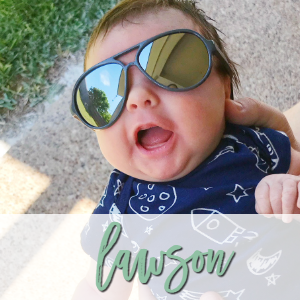 She spent 10 months in the hospital and it just seems like this pregnancy with Lawson has been entirely different. I’ve had energy, I’ve had 1 health issue (which was expected) unlike a bunch last pregnancy, and I’ve been really able to enjoy myself. I will miss being pregnant for sure, but boy, am I excited for Wednesday so we can meet our sweet boy. I can’t even begin to imagine the joy and redemption this rainbow baby will bring to our family. 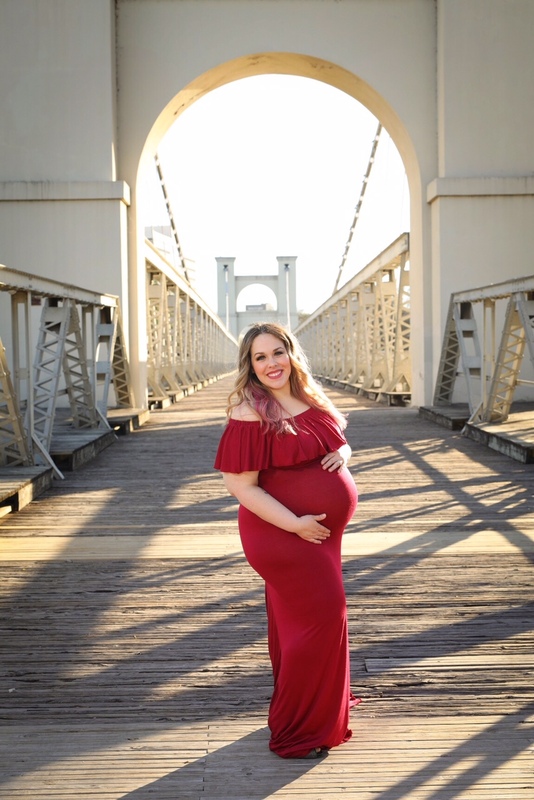 If you’re looking for a maternity photographer in Waco, Texas, definitely hit up Rhonda and Tim with Photography by Legacy Imaging. They always do an amazing job and I’m never disappointed by their incredible work. 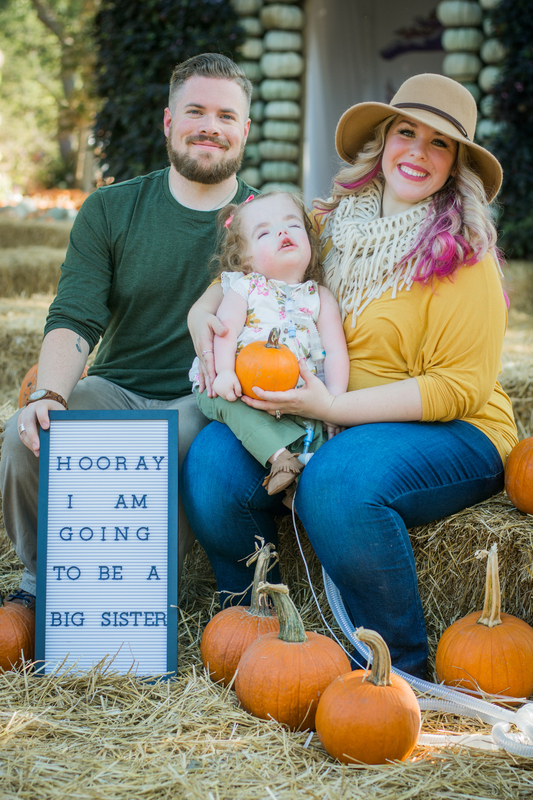 Well, the news is out today and we couldn’t help but tell you guys all about our little Fall pregnancy announcement! 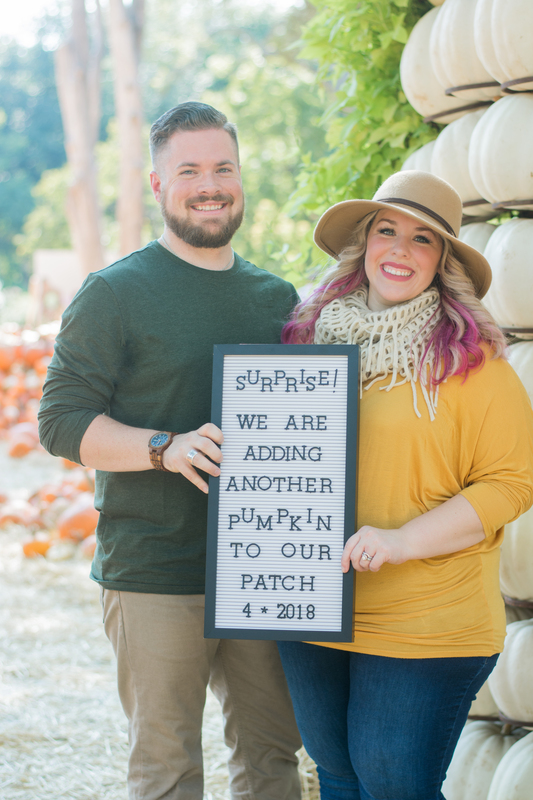 We are adding another pumpkin to our patch! We couldn’t be more excited about this pregnancy and have been waiting for my first trimester to be over (it ends on Friday!) so we can make the big announcement. Many of you have noticed that things have been pretty quiet on social media lately- sometimes going days between updates. This baby has given me quite the morning sickness, or I should say, all day sickness. Between taking care of Addie and napping when she naps, it’s been pretty boring around here. We’re all ready for the nausea and vomiting to go away, but in the mean time, I’m taking it as a big blessing because it means our sweet baby is growing. As you all know, we suffered a miscarriage last year and it was a huge blow to us. We weren’t sure if we’d ever be ready to bring another kiddo into the family, but God had the perfect timing for this sweet angel baby. We found out Sunday, August 6th that I was pregnant, and to be honest, we were a bit shocked! I took a test, and immediately went to tell Mathew. Our faces were priceless. Were we ready? Should we get our hopes up? What would we do if we miscarried again? We just prayed and held our breaths until my first appointment. The first appointment went really well. The last time I’d been in my OBGYN’s office was when I miscarried, so I was really worried. I went by myself so Mathew could watch Addie and everything looked great. My doctor is a really great guy (we know him from church) and asked me to come in a couple weeks later just to make sure everything was ok. Since I was worried about miscarrying, we saw him 2 weeks later. That first appointment was also a bit stressful because it was the same weekend Hurricane Harvey was supposed to hit the Gulf and my family was unexpectedly coming to town so they could escape from it. Addie’s birthday party was the very next day so between running around for last minute party supplies, cleaning the house for family, doing laundry, and getting food for the party, you could say my I was a bit on edge that day. The good news that our baby was a-ok did my heart and mind so much good. Two weeks later, with my crew in tow, we went to see the doctor for a second appointment at 10 weeks. We saw a very strong heartbeat and were absolutely taken aback at how big our baby had gotten in just 2 short weeks. 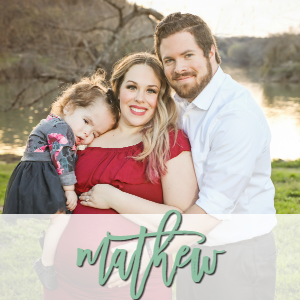 It was so great to have Mathew and Addie there, and we got our very first picture of our baby! We asked a lot of questions- genetic testing via blood tests and amniocentesis, if we needed to worry about anything right now, etc. Thankfully, we got great news that we could do that further on in pregnancy, and we’ll likely talk about it again next week when I have my 14 week appointment. 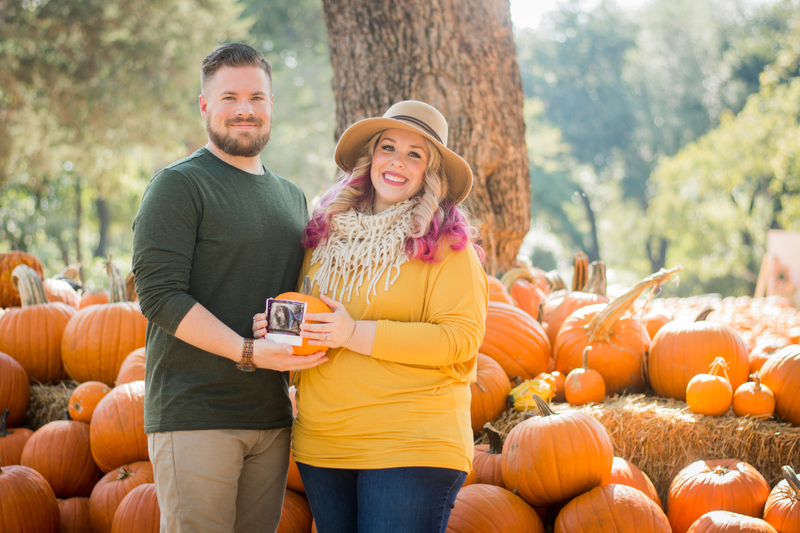 As for our photo shoot, not only did we want to make sure we were out of the woods by announcing towards the end of the first trimester, but we really wanted a Fall pregnancy announcement with tons of pumpkins. 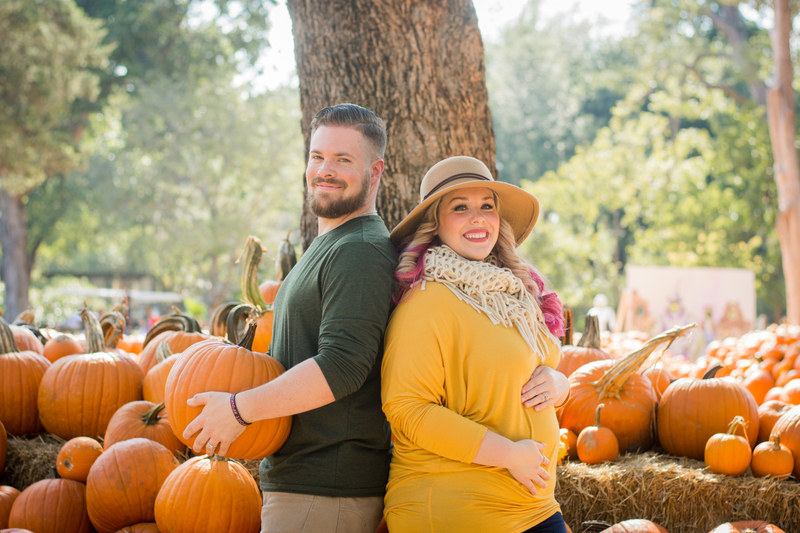 We shot at the Dallas Arboretum because we just love how it looks with all of the thousands of pumpkins. If you’re able to visit the Dallas Arboretum sometime, definitely do it in the Fall because it is INCREDIBLE! Make sure you take a picnic blanket and a picnic lunch so you can relax on the berm and overlook the lake. It’s beautiful this time of year. 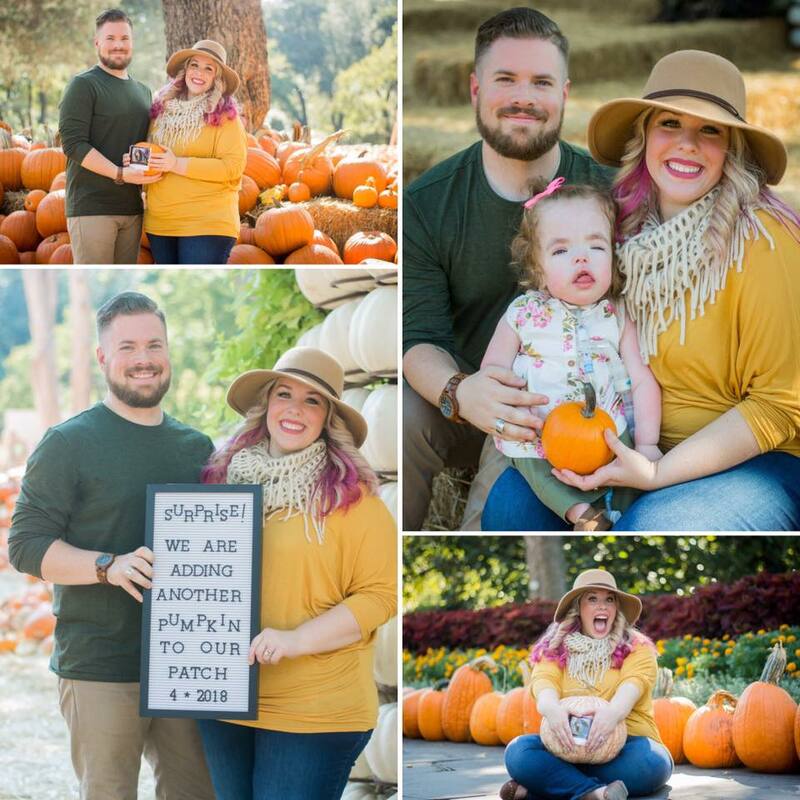 I want to take some time out to thank Teressa with Teressa Jane Photography in helping us with our Fall pregnancy announcement. 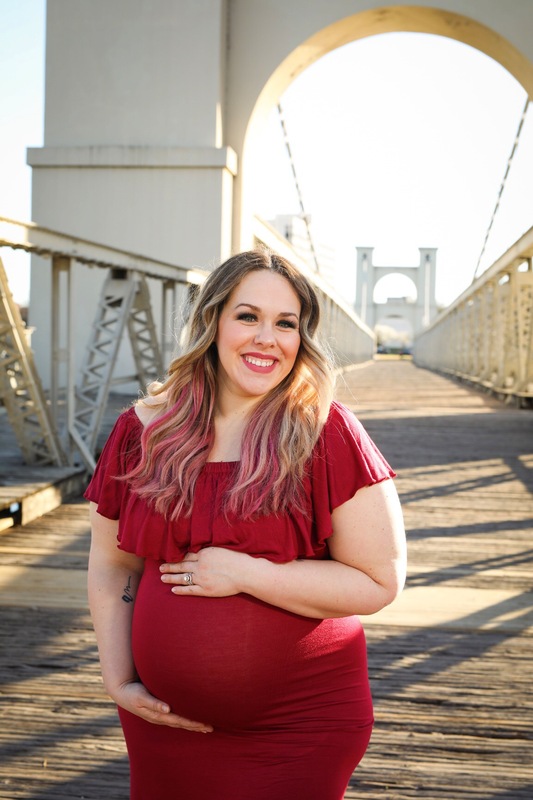 Teressa is currently expecting her own sweet baby in just a few weeks, and she squeezed us into her busy schedule to take these amazing pictures. 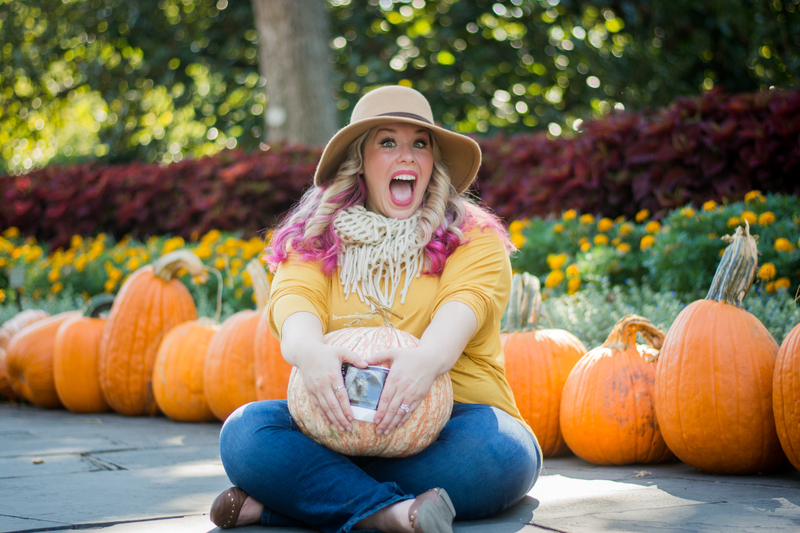 She captured our perfect vision for these Fall pregnancy announcement photos and we couldn’t be happier. I can’t wait to print some out and frame them for the house! Teressa is a dear friend and I’ve known her for a long time through the blogging world. Although we weren’t close, we found ourselves on the same Young Living essential oil team and chat every day about our businesses. It’s been amazing to get to know her and her sweet mama heart so much better the past couple of years. So this is where I leave you, we have an appointment next week to see how things are going and I’ll be updating as much as I can about this pregnancy like I did with Addie. I will say, I’m awfully tired these days and pretty nauseated, so I’ll do my best on updating! If anything, check Instagram or Facebook. And if you don’t watch my Instagram Stories, definitely do, because I update DAILY on there with random happenings! Fun, Festiveness, Fashion, and Fossil! Disclaimer: This post is sponsored by Fossil. All words and opinions are my own and are no way influenced. With Christmas around the freaking corner, I’m panicking. My Christmas shopping isn’t done for my family or my students, we haven’t taken pictures for our Christmas cards, and we still haven’t put up our little 3 foot Christmas tree in our bedroom. I’m just counting and waiting for the days to pass by so I can stop stressing about Christmas. Right now though, I can honestly say that Christmas card pictures are the most heavy on my mind right now. Why have I procrastinated so long?! My family never did the whole Christmas card picture thing growing up, but I knew it was something I wanted to do every year with Mathew once we got married. Really though, the only reason I’ve procrastinated is because I nave no idea what to wear. 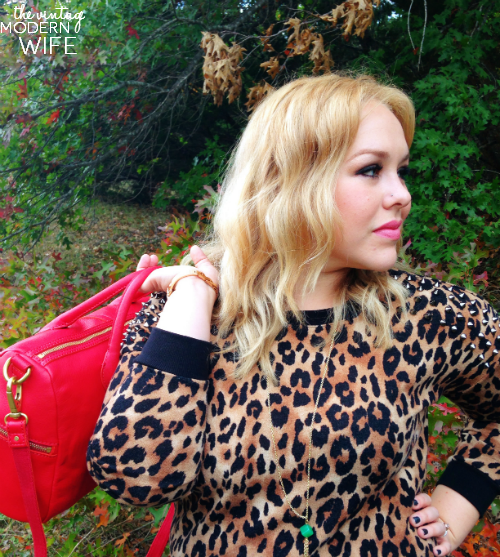 Yesterday with my post about meeting Jessica and Ashlee Simpson, you may have noticed my leopard top that I was wearing. It’s honestly become one of my favorite winter favorites and I’m really considering wearing it for our Christmas pictures. There were some other fun accessories though that I wore when I met the girls that I may have saved just for you today though. They’re fun, they’re festive, and they’re Fossil! Mathew took me out to the park a couple weeks ago to scope out places for our Christmas pictures. Of course, I wanted the feel of the colors that would be in the picture, so I dressed up, grabbed my Erin satchel and Georgia Three-Hand Bangle Watch from Fossil , Jade necklace from Compliment, Michael Kors heels, and went out into the wind and cold. While Mathew was scoping out the scene (mainly so my Michael Kors heels wouldn’t get ruined), I may or may not have taken a selfie in the car to get warmed up for a little picture taking with my outfit. I mean, hello, the red SO pops against the green leaves. I couldn’t have felt more festive (unless we were actually TAKING our Christmas pictures), with my sparkly Georgia watch and my red Erin satchel out in the wilderness. Dare I say that I felt like Jessica Simpson on Newlyweds when she brought her Louis Vuitton camping?! Mathew found us a spot to take a few test pictures for our Christmas cards, and I gathered my things and practically tip-toed in my heels to the spot. Let me tell you- walking in heels in rocks and dirt with your beloved new Erin satchel isn’t easy! I just about tripped 5 or 6 times! 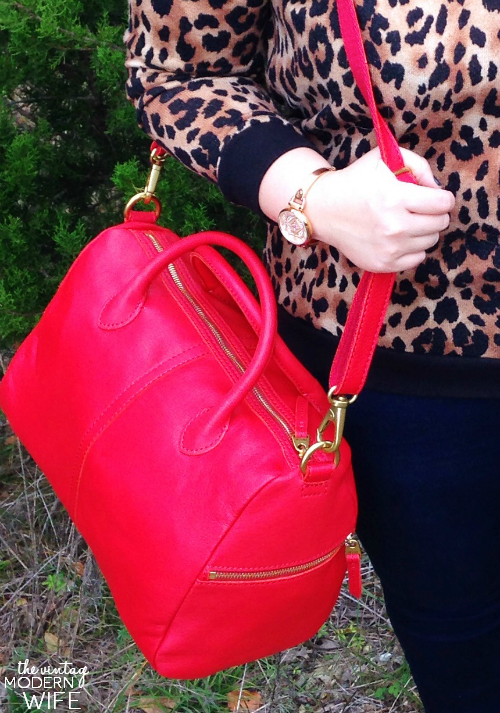 What I love about the Erin satchel from Fossil, though, is that it’s a beautiful bright Christmas red (and comes in 7 other colors! ), has side zipper pockets, lots of pockets on the inside for my phone, blog business cards, and receipts, has a detachable strap, and can hold a LOT. I have an Erin Condren planner that I tote around everywhere and it fits perfectly in there with 2 makeup bags, pens, a big wallet, and there’s STILL room. Out of all the Fossil women’s handbags, this is definitely my favorite. It also holds its shape really well because it’s made with quality leather. I love leather purses (I got a Michael Kors purse for Valentines and have used it every day since), because they last so much longer! I wonder if I put Pearl inside my purse if she’d stay for the pictures. I mean, I just really need an excuse to have it in the pictures haha. For the Christmas pictures, I’m not sure why but I felt like throwing in mixed metals. The studs on my sweater are silver, the Erin satchel has gold hardware, my Compliment Jade necklace and earrings have gold, and my wedding ring is rose gold. I really wanted more rose gold to go with my outfit, so I decided to wear my Georgia Three-Hand Bangle Watch. You guys- it’s so perfect. I got a Michael Kors (wow I feel like I keep saying that!) rose gold watch last year for my birthday, but unfortunately the rose gold plating has worn off a bit, and my watch isn’t so shiny anymore. I didn’t want to wear a dull watch, so I thought the Georgia would be PERFECT…and it was. The face has SO many rhinestones all over it, and the links are designed to look like a bangle bracelet. I’m already excited to pair it with a black dress for Christmas that will just make my whole outfit POP because of the rhinestones and sparkles. Fossil has so many other pretty women’s boyfriend watches though, picking the Georgia wasn’t easy. I want to get the Decker Chronograph Stainless Steel watch too really soon! All in all I think our trip to the park proved to be pretty good. Mathew and I got some fun shots of my cute accessories, and we found the perfect festive spot for our Christmas pictures. Now, hopefully, we’ll get them done and taken care of this weekend so we can mail them out and get them to our friends and family on time! 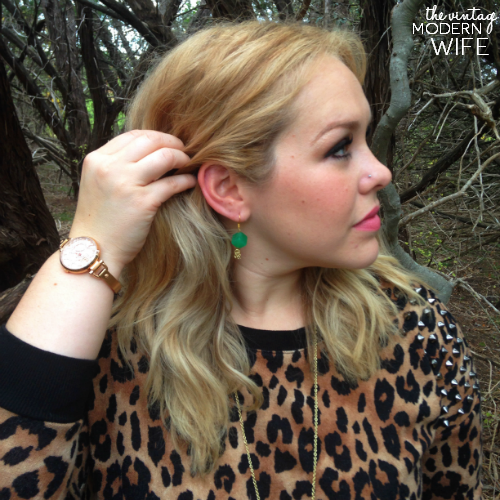 What do you think of my new fun, festive Fossil accessories? Aren’t they perfect for the holidays?